World-renowned Bhakti Yoga instructors, Srila B.P. Janardan Maharaj and Vishakha Devi Dasi, will be at Wave Street Studios for a discussion on Bhakti, devotion, and its relation to Yoga and food. Bringing their vast knowledge of the ancient scriptures from India and their love and devotion to their spiritual masters, they have enlightened and enthused spiritual seekers from all over the world with their heart-warming talks. Starts at 6pm with live question and answer! Indian vegetarian cooking is filled with variety—exotic spices, countless choices of vegetables, and an endless range of preparations—passed down from generation to generation. 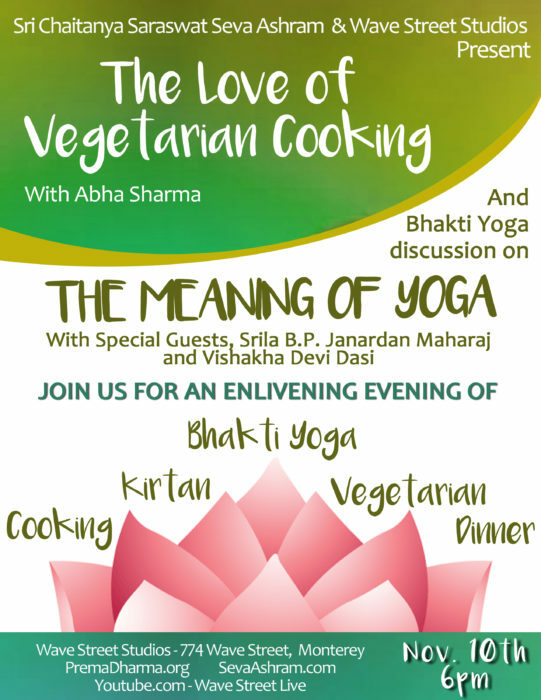 Abha Sharma learned the art of cooking from her family as an integral part of living a devotional lifestyle. Mixing traditional recipes with her own unique flair, Abha joyfully produces delicious dishes of all kinds and shows us how to do it as well. Join us in person or live online on Nov. 10th at 6PM at Wave Street Studio, 774 Wave Street, Monterey, for an opportunity to ask your own questions in real time!